Holla! Contact us here to get your rug on. As anyone who has been in my home can attest, I love me some grey and white. Good choice, Mam, good choice. Karly approved! 1. The very first thing I decided to hunt down was a floor lamp, industrial, please. I was delighted to find this French bendy twisty number and new we would be best friends forever. 2. La couch: while I wanted to go with vintage, I had a hard time finding the right look that didn't need to be recovered. White leather is always welcome in my home, so I settled for this Tufted Leather Sectional. 3. I spent far too much time digging up tables, my desktop folder lives to tell the tail, but finally decided that this Baughman end table was the winner. 4. 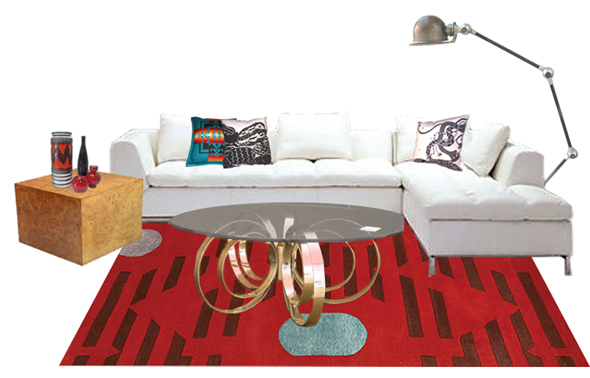 The round glass coffee table made the cut because I passed one up on craigslist once and have regretted it ever since. Note, the ebay version is chrome, but you can bet your bottom dollar that I would have that puppy powder coated in gold faster than you can say "but chrome is so nice." Note part deux: The ebay table is $599, the craigslist version was $60. I fucked up. Since my pretend walls are still bare, how about you dudes make some suggestions?